Inspired By True Events - They could do it. It’s believable. They could do it. It’s believable. Pronouncing “w” like “v” is another thing that is common to vampires. And having spooky servants, obviously. Have a good weekend, imaginary readers! I don’t know about you, but I vas already convinced that they vere vampires. And bats. Vampire bats. 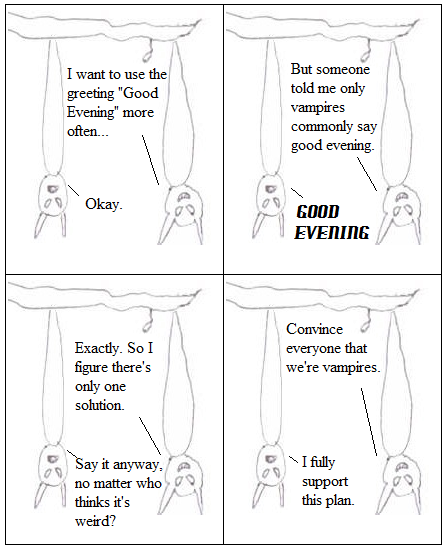 GOOD EVENING VAMPIRE BATS. Man, I feel like a real bloodsucker.